The Super Series of mid-season exhibition games between Soviet and NHL teams took place between 1975-76 and 1990-91. 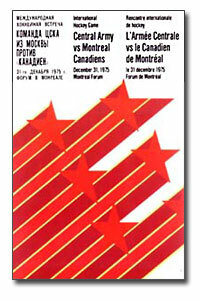 The Series were created after the popularity of the 1972 Summit Series between the Soviet National Team and Team Canada's NHL stars. The Soviet Union was represented by the Central Red Army and the Soviet Wings in the first Super Series during the 1975-76 NHL season. In subsequent years, the USSR sent over Spartak (1977-78), Soviet Wings (1978-79), the Red Army and Dynamo Moscow (1979-80), the Soviet National Team (1982-83), the Red Army and Dynamo Moscow (1985-86), the Red Army and Dynamo Riga (1988-89), Khimik, Soviet Wings, the Red Army and Dynamo Moscow (1989-90), and Khimik, Dynamo Moscow, and the Red Army (1990-91).